I have a bias for teachers. First teachers have been very helpful to me over the years. I was a supply teacher for a couple of days. And my son, Michael has chosen to be a teacher and go wherever the opportunity presents itself and right now that is in New Zealand. It distresses me to read or hear about the criticism of teachers that seems to make them the reason for our education failures. Taylor Mali can be described as a teacher advocate and I think one that deserves a bigger audience. 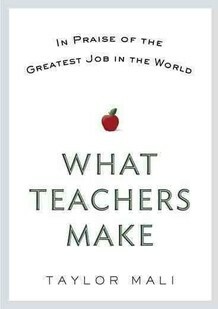 This book is a lot of short examples of what teachers make. Not money, but value. There are some good suggestions for improving teaching. Taylor points out that teachers make students work. Learning how to read and count require work. Learning how to think requires a lot of work. He recounts one experience of a student wanting to write an essay with a viewpoint he did not approve of, but kept his mouth closed and only pointed out she needed to research the topic to make her point. In the end she disproved her original point, but really proved the value of studying a subject before making your final conclusion. As Taylor pointed out changing your mind determines that you have a mind. He quotes William Dumont referring to education as a"a progressive discovery of our ignorance." Another project from the 1990's was to hook up his American students to students with a Muslim background, some in Turkey and some in the States. Surprisingly when asked about their attitudes towards Muslim religious practices, the Muslims admitted they were not particularly religious, although identifying themselves as Muslims (similar to American students who identified themselves as Christians), but it turned out they shared many of the same interests with Michael Jordan of the Chicago Bulls being a prime example. Taylor found technology let him do his job better. He found he could track his students and their grades better on computer programs. He also found ways for his students to work together using computers. Another suggestion he made concerned mentors. He was very grateful when he started teaching full time that an experienced teacher would take 45 minutes a week to review what he was doing and what to expect. He felt it made his time much more productive. Mentoring could be a good use of experienced teachers as they near retirement. Another comment was that in the state of Arizona they could predict how many people would end up in jail by the grade 3 reading tests. If a student couldn't read by grade 3 they seemed destined for jail. But a student costs about half as much per year as it does to keep a prisoner behind bars. My thoughts on teachers. Yes, there are good and bad amongst teachers, just as there are in any field. Should we be able to get rid of really bad ones--yes. Not every one left is top notch excellent, but are they worthless? If they can advance their students they are valuable and should be treated with respect. Are teacher unions bad? Not necessarily--they do fight for better treatment of teachers and that is very very necessary. They also fight for better conditions and that benefits our students and ultimately everyone. I think there are at least two more important groups to consider when criticizing our educational system. One is parents. How many parents talk to their teachers? I mean without assuming the teacher is the cause of their child's problem. How many parents make it easy for homework? How many parents help with the homework? How many parents praise learning and celebrate school success? How many parents actually think of school as a baby sitter? Parents have more influence than any teacher either by what they do or what they don't do. One advantage teachers do have over parents is objectivity. Two is taxpayers. Going the cheap route is not always the best. Our future depends upon our children and that includes for your old age. We are in a competitive global marketplace and many other nations have identified education as a critical driver of growth and are putting their resources into it. Teaching might seem what people do when they aren't good enough to do something else, but good teaching requires skill, talent and support. If teachers are not respected and they aren't paid relatively well potential teachers will look elsewhere. Taylor writes that we live in a society "...where everything and everyone has been slowly squeezed bloodless so as to maximize earnings for a tiny fraction of the population." Education is not just so you can make a living, but so you can get more out of life. I wish I could say I remember the names of all the teachers that had an impact on me, but I can't. Perhaps the most important ones were those who got me started with reading and arithmetic. Lots encouraged me to read more and gave me access to ideas I might not have stumbled on otherwise. At university professors don't teach so much as lecture, but I remember a couple of sociology professors that turned classes into an inter active experience that really got me excited. To get a science credit I took geology which normally might be thought as the ultimate boring topic, but the teacher made it something to look forward to. One name I remember is Ken Musselman who taught me in grade 10 and 11. He was a phys ed teacher at Oshawa Central Collegiate and a bit stereotypical in macho ness, but he also taught mathematics. One day one of my classmates was having trouble with some geometry concept and Mr Musselman focused on him trying to help him understand. When words failed he sent the student out to get a string and then he demonstrated with the string. The student did go on to have a minor professional sports career and become an accountant.